This paper characterizes dairy production systems in India, Tanzania, Kenya and Nicaragua, and describes the genetic and breeding technologies that hold promise for the advancement of global development goals. In all the countries, a large number of smallholder farmers operating mixed crop–livestock production systems play a significant role in dairy production. In Tanzania, Kenya and Nicaragua, milk is predominantly produced by cattle of genotypes that differ both across countries and among production systems within the same country. In India, buffaloes contribute to a larger proportion of the national milk than cattle. 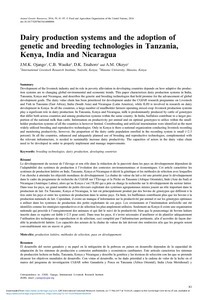 Information on productivity per animal and on optimal genotypes to utilize within the smallholder production systems of all the countries is however limited. Crossbreeding and artificial insemination were identified as the most widely utilized breeding and reproductive technologies. Only in Kenya is there a national organization conducting livestock recording and monitoring productivity, however, the proportion of the dairy cattle population enrolled in the recording system is small (<2.5 percent). In all the countries, enhanced and adequately planned use of breeding and reproductive technologies, complemented with the relevant infrastructure, is needed to sustainably increase dairy productivity. The capacities of actors in the dairy value chain need to be developed in order to properly implement and manage improvements.